You might want to write this down: The first thing I did was tape off the wall, window, ceiling and floorboards. Then I threw old sheets everywhere, this part is very important unless of course, you’re wanting to replace the carpet too. The first thing I painted was the ceiling, I just used basic ceiling paint. Then I painted the other walls a lighter color in the same pallet. Using my silhouette cutting machine, I created a stencil and penciled in the design for the accent-part of the wall. I traced the area first and then stenciled them far enough away from each other that I wouldn’t get wet paint smudges. I did A LOT of touching up by hand. It obviously needs a few more final touches as far as the decorating go but I was way too excited not to post this right away. Enjoy!! Love it, you’re amazing at detail I’ll have to come see it in person. The “all this gots to go” comment killed me! Too too funny! 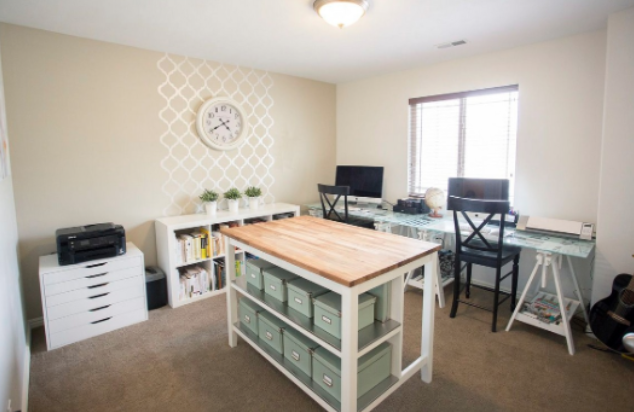 I LOVE this office transformation. And that stencil makes my heart happy each time I’ve seen it. I have a similar stencil on a kitchen wall, though yours has cleaner lines. So pretty though! Thank you so much! I really love this room!!! I really love the wall detail. The whole thing is gorgeous but that really pulls it all together!